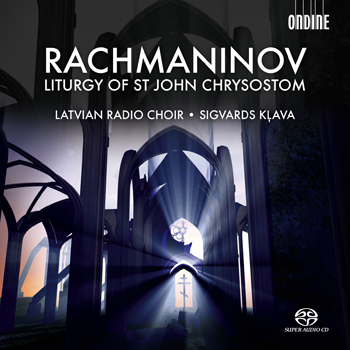 This may be the finest performance on disc of Rachmaninov's (...) Divine Liturgy of St. John Chrysostom. The Latvian Radio Choir not only possesses the rich-colored tone (those altos!) and substantial vocal range (those basses!) (...), but also leaves no question as to its collective, deeply felt understanding of the meaning of the texts and of the overall service itself. Ondine julkaisi erittäin onnistuneen levytyksen Rahmaninovin kauniista, vaativasta ja silti perinteitä kunnioittavasta Liturgiasta. (...) Ammattimaisen kuoron ylivertainen tekniikka luo tulkintaan rentoutta, ja se taas mahdollistaa musiikille olennaisen hartauden. The Latvian Radio Choir's singing is sensuously beautiful: the tone Slavic, but more refined and better blended than some of that provenance. The choir boasts rich-toned basses capable of sustaining the low B♭ in the Credo. The performance is both devotional and thrillingly dynamic. Pacing is subtly varied to underline the text, often creating, as at the beginning of "In Thy Kingdom," a breath-catching sense of time suspended. The balances achieved by Kļava and his chorus of 25 are ideal; the exquisite rising of the pure-voiced soprano soloist from the chorus in "We Hymn Thee" is but one of many examples. The pitch and diction are exemplary, whether the voices have been tapered to a mere thread of tone or are ringing in the great dome of the Riga Cathedral. The two liturgical soloists are excellent in their truncated roles. The Latvian Radio recording is stunning, creating a palpable sense of the chorus in a large reverberant space with no loss of focus or clarity. The Latvian Radio Choir sing with the kind of hushed reverence and understanding one would expect, given Latvi's connections with Russia and the Orthodox Church. It also sings with a sound that is distinctly "right," as well as with great technical polish. This is a performance I can recommend confidently in spite of the competition. A decided plus is the multichannel recording, which truthfully captures the vast, reverberant spaces of the (Lutheran) Dome Cathedral in Riga. Soinniltaan suurenmoinen Latvian radiokuoro tavoittaa upeasti ortodoksimystiikan tunnelmat. The Latvian Choir are as close to the (Russian) source as you could wish for, and this is a reading that ticks all the boxes for authenticity (...). This recording is made in very fine SACD audio (...) but even in stereo, the sound is rich and enveloping. This a cappella choral work is performed by one of the foremost choruses in the world, the Latvian Radio Choir, under the direction of Sigvards Klava. The soloist roles are sung by Kārlis Rūtentāls (tenor; celebrant priest) and Gundars Dziļums (bass; deacon). The recording was made at the Riga Dome Cathedral in March/April 2008. Audiophiles owning a SACD player will be stunned by the surround effect of this CD/SACD hybrid recording.